This document is copied verbatim from an unattributed document residing in Tewkesbury Museum’s collection. This appears to have been written in 1987, at the time of the disposal of land and rights in Knave’s Acre to Allied Mills, and the realignment of the public right of way on to the Ham. The appendices, and particularly the drawings, need more explanation than they are given, and the main text has not been annotated to reference these appendices. And that the Burgesses aforesaid should have common of pasture for their cattle in the common pasture of the Borough aforesaid according to the burgages which they had in the same Borough as hitherto they have accustomed to have. From the Roll of Charters, No. 21 in the 11th year of Edward III. (1314). This is proof, if any were needed, that the commoners’ rights to certain usages in the Ham are of very long standing. Five hundred years on, the burgesses, some of them, retain that right, or something like it, but not for want of trying on the part of others to deprive them of their due. The history is dotted with law-suits either aimed at taking away some or all this ancient right, or in defending it. The Severn Ham at Tewkesbury is rather smaller in the twentieth century than it was at the time of the charter quoted above. About 20 acres have been lost to industrial use or river changes. The boundaries five hundred years ago are easily defined in words but less easy to decipher on the ground. The Ham is an island between the Rivers Severn and the two arms of the Avon. To most people the Ham starts at the mill in Quay Street and extends south and west to The Point. This supposition omits the most interesting part of the area. 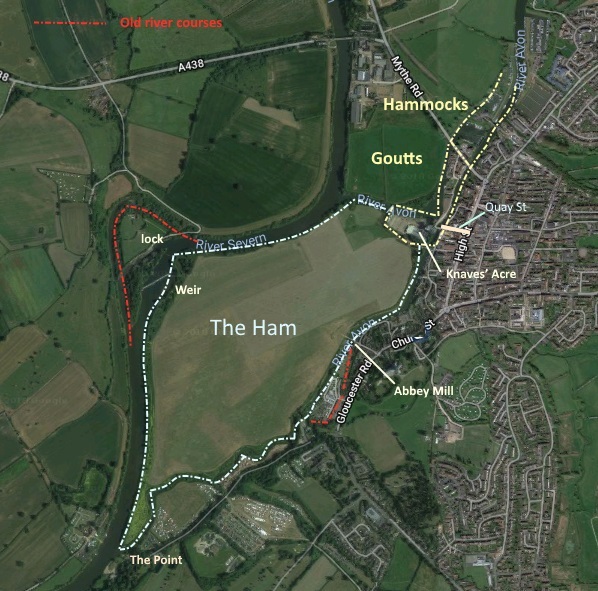 Using the definition given above the Ham is shown to extend from the northern tip of the Goutts, now submerged beneath the waters of the marina and to include the whole of the Hammocks (now masquerading under the name of King John's Island), the lock, the Hangings and the mill area. Such an irregular shape makes any estimation of area difficult. Perhaps the best estimate is that given by the award of 1811 which divides the area into 24 sections totalling 193a. 2r. 10p (acres/rods/perches). The Severn Lock and weir built in 1856 took about 14 acres leaving 177a. 0r. 16p. of which 153a 2r. 34p. was in one ownership. (1932) Approximately 3 acres was lost in 1935 when the New Avon was re-aligned and further encroachment has taken place on the north side. (see Knaves’ acre.) The acreage in 1987 is about 170 acres. Two maps survive in the County Records Office. That of 1791/92 shows acreage and some occupiers: that of 1811 shows acreage owned by individuals. (See Appendix). Boundaries on the ground are marked by stones. most of which have now disappeared as there is only one owner, to all practical purposes, and the Iand is let for the grass in blocks of about 30 acres. 1811 Tewkesbury Inclosure Map. Click to enlarge but -Warning- the image is 12Mb! Details of post-1811 ownership have been difficult to ascertain due to the loss of the deeds to the Dowdeswell Estate. Assumed to have been deposited in the local branch of Lloyds Bank, when requested for the sale of 1932 they could not be produced. They may have been with the mortgagees, P.B. Finance, London. The freehold of the Dowdeswell holdings on the Ham was bought by the Town Council for £1500. Between 1932 and 1963 they obtained the remaining small patches with the exception of 4 acres at the Point, owned by Allied Mills in 1987 and one acre, location and owner unknown but which may be the acre owned by the Abbey in 1874. Before 1811, details of ownership are not so well known. Early freehold was in three major parts: that held by the Manor of the Town; (better known as Warwick’s Lands); that held by the Abbey, or Barton Fee; that held by individuals. The ownership of Warwick’s Lands is fairly well documented from the time of William I. From Domesday until the time of Henry VIII this was a part of the Manor of Tewkesbury and for the latter half of this time included 94 acres of the Ham. Henry VII forced the old Countess of Warwick to hand over the vast Warwick Estates, which stayed with the Crown until 1547 when they were made part of the grant to Thomas Sudeley of Seymour. The second largest part of the Ham was 44 acres; part of the Barton Fee. This was granted by Henry VIII to Messrs. Stroud, Earle and Pagett, and later acquired by the Earl of Essex who retained control until 1824. Making up almost the whole of the rest of the Ham was a collection of small plots which included the ferry at Over-lode. This was granted by Edward VI in 1553 to Edward Cowper & Valentine Fayreweather. It formed part of a larger holding granted to Edward Pert in 1575. J. Pert, heir to Edward, assigned this land to John Brydges in 1597. Brydges surrendered it to the Crown in 1605, receiving it back, for a fee, in the same year, for a term of 40 years. After his death his executor the Earl of Dorset assigned the remainder of the term to Dowdeswell. The Craven Estates held 11 acres near to the Abbey Mill but by what right is not certain. These were added to the Dowdeswell Estate in the 19th century. Either out of the Pert Grant or in addition to it, or some combination, between 1640 and 1791, about a score of small plots became owned by individuals. They were almost all in the form of narrow strips based in the lower Mill Avon, none larger than four acres. 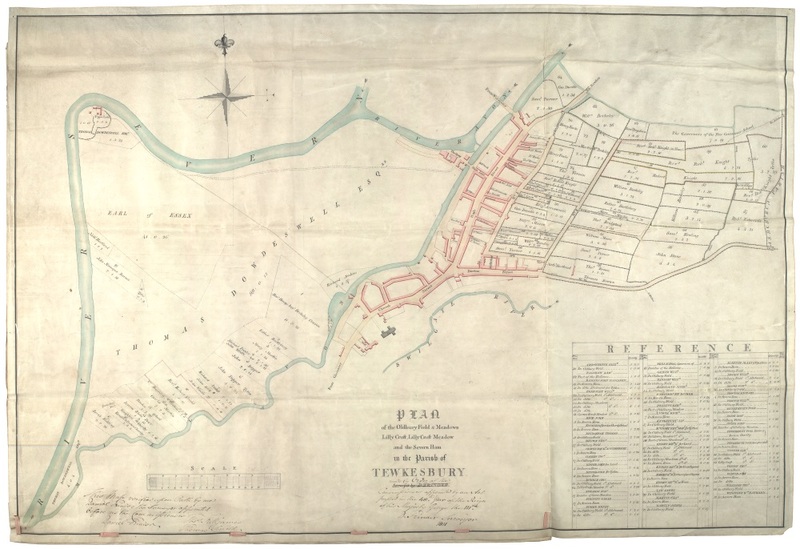 The facts known are few; they were in individual ownership in 1791; by 1932 Mary Martin, Michael Procter, John Wintle and John Dipper had sold to the Dowdeswell family; that the Mann plot had been isolated on the west bank of the Severn in 1856; that the charity plots had been sold to the Town Council by the Consolidated Charities by 1968 and that 4 acres at the Point were owned by Allied Mills in 1986. Finally there was one acre “Somewhere on the Ham", owner unknown, taken over by default by the Town Council in 1968. By 1987 the Ham was in the hands of one owner, for six months of the year. 1 the forfeiture of land and civil rights suffered as a consequence of a sentence of death for treason or felony.